The New Mexico Rail Runner is a commuter train between Albuquerque and Santa Fe. 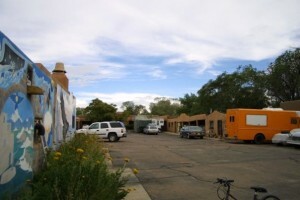 The Downtown Albuquerque station is on Central Avenue, near the Route 66 Hostel. Disembark at the South Capitol station in Santa Fe, which is within walking distance of the hostel. After disembarking at the South Capitol RailRunner station, walk south/west along the road that parallels the tracks a very short distance to Alta Vista St. Turn right onto Alta Vista St. and walk another short distance to Cerrillos Road. 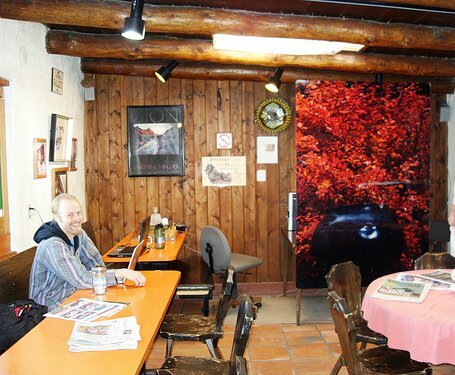 Turn left (south/west) on Cerrillos Road and walk about 1/4 mile to the hostel at 1412 Cerrillos Road. Take I-25 south to the St. Francis exit (exit 282.) Take St. Francis 1 mile to Cordova. Turn left onto Cordova and turn left at the next light onto Cerrillos Road. Take Cerrillos Road south approximately 1/2 mile. The hostel will be on your left and you will see the tall Zozobra mural at the northmost corner, then an outdoor patio, then the parking lot. You will have to go just a bit past the hostel and make a u-turn. Coming down the long hill into Santa Fe, bear right. This becomes St. Francis. Go through several stoplights leading to the first complex intersection and turn right on Cerrillos Rd. and take it 1/2 miles. The hostel will be on your left and you will see the tall Zozobra mural at the northmost corner, then an outdoor patio, then the parking lot. You will have to go just a bit past the hostel and make a u-turn. Take I-25 North to Santa Fe. Take the Cerrillos Road exit (exit 278.) Continue north on Cerrillos Road about 6.5 miles to the Santa Fe International Hostel, which will be on your right at 1412 Cerrillos Road, roughly 1/2 mile north of the St. Michael’s Intersection. The city transit system ends two miles short of the airport, so the best way to get from SAF to the hostel is to take a taxi. Click here for Santa Fe taxi information. 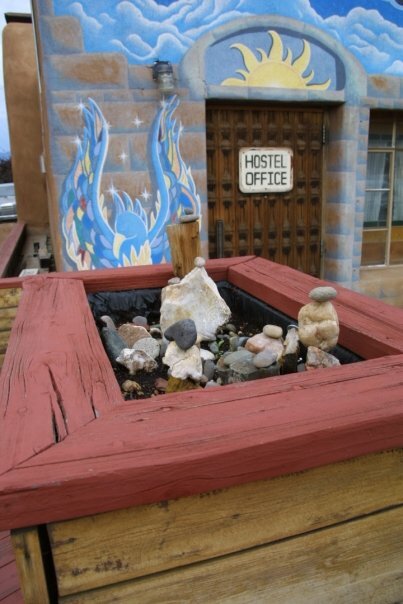 Tell the driver that you wish to go to the hostel at 1412 Cerrillos Road, between St. Michael’s and St. Francis. If you wish to explore Albuquerque, you can enjoy the city (including the Route 66 Hostel) and then take the RailRunner to Santa Fe. Click here for directions. Santa Fe no longer has a Greyhound station, but fortunately it’s easy to get here from both the Albuquerque and Denver Greyhound stations. 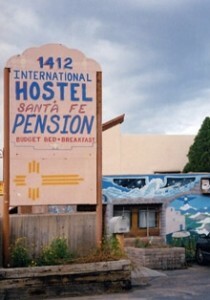 Please click here for directions from Albuquerque to Santa Fe via RailRunner, and for walking directions to the Santa Fe International Hostel once you have arrived. From Downtown Denver’s Greyhound station, take a quick taxi ride or take a short walk to the Mexican Buses, such as the El Paso / Los Angeles Limousine at 2215 California St, just a few blocks from the Denver Greyhound station. Click here for details on how to take the Mexican Bus to Santa Fe, and how to get to the Santa Fe International Hostel once you have arrived. NOTE: If you’re coming from Albuquerque, your best choice is to take the RailRunner. Click here for information. If you are coming from Denver or other points north, you can get to Santa Fe direct from Denver via Mexican bus lines, most notably the El Paso – Los Angeles Limousine Service. (It’s a bus, not a limousine.) This bus runs between El Paso, TX and through Albuquerque, Santa Fe, Denver and as far as Los Angeles, CA. This bus isn’t fancy – but it’s better than Greyhound! The arrival station in Santa Fe is a gas station near the highway. From this gas station, you may wish to walk (4 miles), call for a taxi, or contact the hostel at (505)988-1153 for the possibility of finding a ride from one of our guests or staff. You can visit the El Paso – Los Angeles Limousine Service Website for schedules, contact numbers, or to purchase a ticket online. To get from Lamy to Santa Fe, you’ll want to take the Lamy Shuttle, which will drop you off at the hostel’s front door. The fee for the Lamy Shuttle from the station to Santa Fe is often included in the price of your Amtrak ticket. You’ll want to verify that. The Lamy Shuttle generally requires reservations. If your Amtrak voyage ends in Albuquerque, you can take the RailRunner to Santa Fe from there. Directions are here. If your Amtrak voyage ends in Denver, you can hail a taxi or walk through downtown Denver to the Mexican buses which will bring you to Santa Fe. Click here for information on the Mexican Buses that take you to Santa Fe. Santa Fe is not a city with taxis that you can hail from the curb. There is one company, Capital City Cab, and you have to call ahead. Sometimes they even show up. 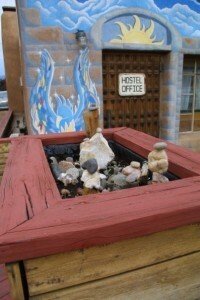 Feel free to call the hostel at (505)988-1153. We don’t promise to pick you up, especially during the busy season, but it’s worth trying. Just don’t be mad if there’s no one to come for you, okay?